I always seem to gravitate towards Nitrome’s games. I don’t know what it is, but I always pick up their latest game not knowing that it’s actually them. And there’s a common theme after all these experiences — I usually come out enjoying myself. With a neat new gimmick, now I can add Leap Day (Free) to that list. With an automatic movement system, the only thing Leap Day tasks you with is pressing the screen to jump. It’s basic, sure, but there’s a lot of depth to it once you really dig down into it. For starters, double-jumping is in, which allows for some really crafty and devious level designs that skew towards vertical leaps. This works well in tandem with the wall-jumping and wall-sliding abilities, which works surprisingly well despite the auto-running. Jumping can get very technical, especially when spikes, moving platforms, and roaming enemies (or those who lie in wait) enter the equation. Leap Day rolls with the best of them in that regard, and becomes a thinking man’s game in many ways, forcing the player to divine the best possible solution for any given puzzle. And that’s what a lot of the game’s sections are — puzzles — sometimes with multiple solutions in tow. It’s simple, and works just as advertised. Every day players can log in and find a new randomized level to play, some of which feature entirely new themes, enemies, or hazards. I loved that you can go back and replay old stages you’ve completed, or any other previous level for that matter by unlocking them by way of a video ad. While some games that are ad-supported feel like a squeeze, blowing through a short clip to play what could end up being a 10 to 15 minute stage (depending on how tough it is) is always worth it. Also yes, every daily stage does have an end, in case you were wondering, which tabulates your total fruit collection percentage as a score of sorts. There comes a time where you’ve seen most of what the game can do, but nearly every layout is competent at worst. 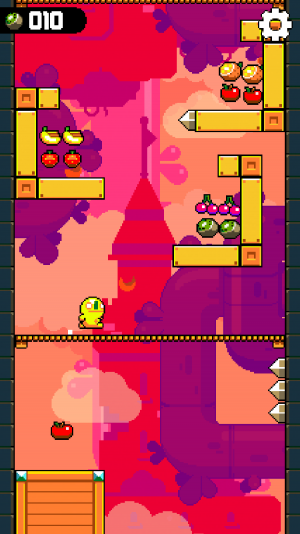 Nitrome promises more updates though, so there’s that. I also really like the setup, and a lot of parts are so subtle you could miss them. Like how at the very start, it makes it clear that “Leap Day" is a game show of sorts, for the amusement of citizens and their king, who is chowing down on the very bottom level. I don’t know if our hero is a different gladiator every time, or if he’s stuck in the same endless loop daily, but it’s a tiny little thing that elevates the game a tad. As a free game, Leap Day takes a very interesting approach to IAP. After reaching a new checkpoint every few levels or so, players have the option to use fruit that they’ve acquired in-game to “trigger" said checkpoint, or watch a video ad. You don’t need to hit every checkpoint, but it’s incredibly useful to do so as some areas are very tough, and having to go back through a massive gauntlet might set you back further than you’d think. While I personally don’t mind watching these occasionally when I’m just out of reach on my fruit meter, I do wish that there weren’t as many varieties of fruit, as you’ll often find that you’ve collected just enough of nearly every variety except the ones you need. Alternatively players an opt for a $3.99 purchase, which converts the game into a premium app, allows all checkpoints, and nixes ads. Unless you’ve played for over a week and are outright addicted it probably isn’t worth it, as the text ads are very unobtrusive, only appear after multiple subsequent deaths, and can be canceled immediately. But the fact that it’s there, and is the only actual IAP option available for cold hard cash, is appreciated. 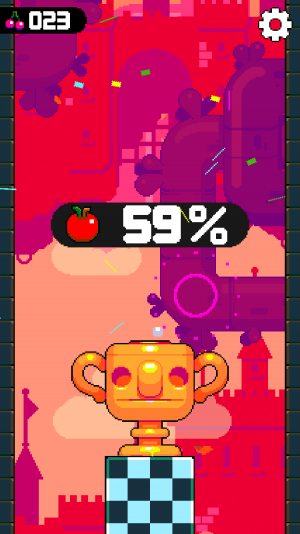 I wish more games had this, as Nitrome has every opportunity to nickel and dime players with power-ups and energy timers, but at the present time, hasn’t resorted to any of that. With no need to spend any money, Leap Day is the perfect pickup for people who want to find a new platformer to warn them by the fire. Some levels are randomly better than others, but tomorrow is always another day.